A vacation filled with relaxation awaits at Baan Ora Chon. The villa’s incredible beachfront location, direct beach access, infinity pool and excellent service (like personal chef service and an in-villa wine selection) are just some of the highlights you’ll enjoy. Containing five capacious bedrooms, Baan Ora Chon is ideally set up for sharing with friends and families. Five bedrooms sleep a maximum of 10 guests in Baan Ora Chon. Three king beds, single beds and, a pull-out bed are spread out across the rooms, and three of the rooms feature a terrazzo bathtub with views out to the garden, pool and ocean. 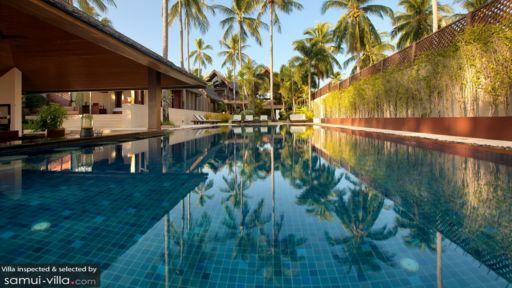 A glistening infinity pool takes centerstage outdoors at Baan Ora Chon. Poolside lounging in highly encouraged here - a poolside bar lets you sip cocktails while enjoying a dip, and recliners set under the shade of patio umbrellas offer a comfortable spot for shaded siestas and sunbathing. The sprawling lawn offers plenty of space for al fresco dining, and best of all, the beach is only steps away from your garden! With indoor-outdoor living spaces that are bright and breezy and a colour scheme infused with warm orangey hues, Baan Ora Chon was designed to offer the best of tropical living. The main living area feels wonderfully expansive, thanks to the full length glass sliding doors and high ceilings. A well-equipped kitchen complete with granite countertops expands out to include a dining area and indoor lounge. Movie nights are best enjoyed in the TV room with plush red sofas centering around a flat screen TV. Your stay at Baan Ora Chon includes the following services: on-site villa manager, in-villa chef (cost of groceries are additional charges), concierge service for tours and activities and airport transfers. In-villa spa treatments, vehicle rental and villa pre-stocking are available at additional cost. Tucked away in west Samui, Lipa Noi will appeal to villa vacationers seeking a restful, relaxing getaway. The vibes here are serene and peaceful, and is a refreshing change from the more popular regions of the island. 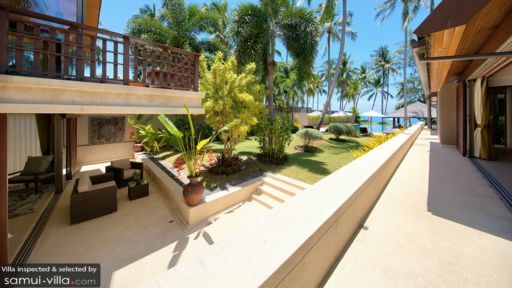 Baan Ora Chon’s prime location puts guests within easy reach to the beach, restaurants and attractions. While a beachfront extends out from your villa, Lipa Noi Beach offers a different ambience. The vibes are family-friendly, and there’s also Nikki Beach Club - a stylish seafront venue that dishes out fabulous Sunday brunches. We like The Five Islands and The Island View Restaurant for upscale dining. Some of the freshest catches on the island can be enjoyed at beachfront restaurants located in Thongkrut Fisherman’s Village. A day trip out to Angthong National Marine Park is an activity that villa vacationers across all ages will enjoy. There’s something for everyone - from beach strolls and sunbathing, to swimming, kayaking and snorkelling. To arrive at the islands, hop on a speedboat departing from Nathon Pier. The journey takes about 45 minutes, and Nathon Pier is about 20 minutes’ drive from your villa.